Whoever first considered gargoyles an attractive addition to buildings, must have had an odd personality. I have never developed an appreciation them. What’s worse is when moonstruck (lunatic) architects deem gargoyles suitable for adorning churches. There are too many examples out there to count. I am sure there are a number of websites devoted to them. But I don’t care enough to investigate. It is one thing to shape a natural or fantastical creature to use as a rain spout on a building. Quite another, in my opinion, to opt for a grotesquery. Churches should stick with symbolism that edifies the people. Admittedly, this can include some potentially gruesome subject, such as images of martyrdoms. Our familiarity with the crucifix itself has dulled the impact of its terrible agony. We often fail to recognize the magnitude of the suffering Jesus endured. Gargoyles were in the news this week. The reason for their appearance gave the title to this column. A tragedy occurred in Chicago when a gargoyle broke free from a dated building and struck an innocent pedestrian. She was killed almost immediately by the crushing blow. To make matters even more sad, the building from which the “ornament” fell was a church. Sarah was the name of the victim of this tragic accident. I invite your prayers on behalf of this young woman’s loved ones, especially her two children. I think so little of church gargoyles that I included the subject in an as yet unpublished book set in the medieval period. 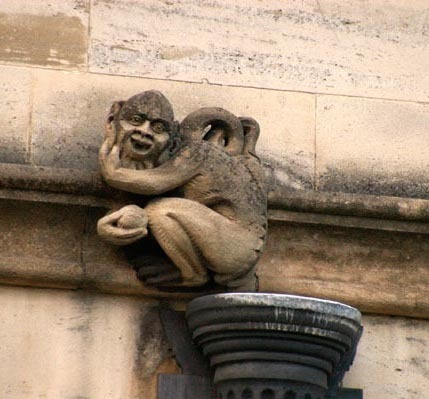 The nightmare gargoyle pictured on the top of the page adorns Magdalen College in Oxford. It was established in 1458, and was the school where C.S. Lewis began his teaching career. Well, the college may be named after Mary Magdalene, but at least it isn’t a church. As for the stone “portraits,” they sound like a very agreeable adornment. In two other letters written the same year, Lewis revealed that there was much more to his new academic post than mere architecture that appealed to him. Oxford had taken Lewis for granted, and often belittled him because of his simplistic trust in Christ. You know I am going as a Professor to Cambridge? My new college is Magdalene, Cambridge: a tiny little place compared with this, but a perfect gem architecturally and (I think) much more congenial socially & spiritually. Did I tell you I’ve been made a professor at Cambridge? I take up my duties on Jan. 1st at Magdalene College, Cambridge (Eng.). Note the difference in spelling. It means rather less work for rather more pay. And I think I shall like Magdalene better than Magdalen. It’s a tiny college (a perfect cameo architecturally) and they’re so old fashioned, & pious, & gentle and conservative– unlike this leftist, atheist, cynical, hard-boiled, huge Magdalen. Perhaps from being the fogey and ‘old woman’ here I shall become the enfant terrible there. It is not about architecture at all—or the presence or absence of grotesqueries. It is about finding a home where you know you are welcome and appreciated. A place where you do not need to remain constantly on your guard, because there are colleagues present who desire to see you humbled. It is good to know C.S. Lewis spent the final years of his teaching life in an academic family that truly appreciated the gifted scholar in their midst. That next to last paragraph should be a goal to set for anyone’s life. You know with all the good advice from great persons past, it’s sad so few listen or heed it? Great insights. People often (in a superstitious way) associate misfortunate and genuine accidents with intention and purpose. I like most gargoyles, though the more human-looking they are the less I like them. Perhaps I had too much of The Princess and Curdie in my childhood, but dragons and monsters filled my drawings and sculptures even as a child, and the fascination still manifests in some of my masks. I find gargoyles interesting, and strangely comforting, though I can understand questioning their existences in church architecture. That someone lost her life because of one, of course, is tragic. Hmm, have you read The Princess and Curdie? I don’t recall if we have talked about it at all. At any rate, I find it illustrative of why I find a good (in the moral sense) monster comforting. The divide between outward appearance and inward reality is a great one, and with carven monsters, it is up to me whether I want to see them as malevolent or good or even humorous. This is excepting the ones that are depicted as eating people, of course. So, to me, gargoyles and their less-practical cousins the grotesques, add a kind of life and whimsey to architecture that would, otherwise, be rather stark (though still beautiful). Usually they are either so-ugly-they-are-cute, like French Bulldogs, or else bizarrely graceful, like gryphons and dragons. I especially love the ones to be found in unexpected nooks and corners. That sums up the danger of the love of strangeness very well without condemning that love, for Phantastes is nothing if not strange and rather gothic. So… I suppose I could say I find gargoyles and their ilk comforting in that they please my love of the strange. There are other reasons, too, that are somewhat less childish. Artistically, of course, I love the freedom of imagination, and even humor, displayed in the creation of grotesques. They are, as a rule, much more free-style and whimsical than other gothic forms. There is something, as well, to be said for the contrast they provide. A cathedral of only beautiful things would not only be rather less interesting, visually, but it would also be dishonest if it is intended to be an allegory of creation and the Christian faith. Whatever else we do, we should not deny the existence of spiritual ugliness. …he’s a grotesque, and not something most people would like to look at. But in making him I worked through some dark depression, anger, and frustration. He is a kind of confession and prayer in clay, and making him freed me to make beautiful things as well. Perhaps there is some of that in our gothic grotesques. Sometimes, I feel like making monsters, and sometimes I feel like making angels. Thank you for taking so long to explain exactly what you mean. And thank you, especially, for the very apropos quote from Lewis. I should have said in my remarks, rather than simply try to infer it, that I draw a personal distinction between those adornments that are neutral or genuinely attractive… and those which are grotesque. In fact, I refuse to use the word grotesquery for human, natural and even positive fanciful forms (say, for example, unicorns). I love gargoyles! When we lived in France I became a fan of Medieval architecture and made a little hobby of photographing the gargoyles on churches we visited. I’ve collected a few plaster replicas and have them in my house. I read a bit about them when we lived in France. They were designed to be ugly and placed around the outside of churches because they were meant to frighten away demons. Of course, we know that no ugly stone creature can do that, but that was their original purpose. They themselves do no represent anything horrible, contrary to some peoples’ beliefs. Jubilare is not so far out there finding them “strangely comforting.” I wouldn’t go that far :) but I do like them. But then again, I think the “Addams Family” is one of the funniest movies I’ve ever seen, so I’ll grant you that I’m a bit weird and crazy! It is, of course, tragic that one fell off a church and killed a woman. It is equally tragic when construction equipment, etc., falls on passersby. In the French film “Amélie,” that is exactly how Amélie’s mother dies. That is, of course, a cynical and ironic French commentary on the church, because Amélie’s mother is killed as she comes out of the church, having just gone to mass. I’m not sure I’d call the Medieval architects lunatics or moonstruck. I think perhaps “misguided” might be more accurate. Note that gargoyles are generally found on the outside, not the inside. Obviously an 1874 church is not Medieval, and the architects most likely put the gargoyles on–not out of any belief that they would scare away demons–but in an attempt at creating neo-Gothic architecture. I assume since two mature Christian women like gargoyles enough to respond to my criticism here, that there must be many more out there who find them attractive. I’ve heard the notion that they were placed on the outside of buildings to scare away worse presences, and although that does ring true with primitive superstitions, I would need to read some contemporary references to the intention to be persuaded. I enjoyed visiting European cathedrals, including Notre Dame. Gothic cathedrals are not at all my favorites though. Much too “cluttered” and “ornate” for my tastes. A good basilica suits my tastes much better. And the less cluttered, the better. On the other hand, you can never have too many mosaics and stained glass windows in my opinion. I guess our tastes differ. And I respect both of you and your opinions. But I doubt I’ll ever like them. Of course, who am I to talk. I have a Union cavalry sword suspended in my office, in memory of my great-grandfather’s service… not his, unfortunately, but a genuine one of the same model they were issued at the outset of the war. I’ve heard many different accounts of the original purpose of gargoyles, including the one mentioned by mimiswardobe. :) Another is that they were meant to represent demons fleeing holy ground. Some are also probably meant to be representations of sins, or are otherwise allegorical. I assume that the reasons behind their existences vary as greatly as their forms. On a side-note, though, my love for mosaics easily equals that of gargoyles, and I love a clean and elegant basilica as much as I love a crazy, cluttered, gothic cathedral, though obviously for very different reasons. The only architectural styles that I really don’t like are Rococo, some of the more ornate Victorian styles, and some of the more sterile forms of modern architecture. I think it’s hard to set boundaries on what is a twisted distortion of nature, or demonic (in a visual sense). While we have some instinctual appreciation of beauty, much of what we come to consider beautiful as adults is conditioned. We consider a Pegasus beautiful, but stick bat-wings on a horse and we hearken to “demonic” imagery instead of angelic… but this is because our ancestors depicted angels with feathered wings and demons with bat-like wings, and perhaps because bats are nocturnal and therefore “scary.” If we were taught, instead, that bat-wings are as beautiful as bird wings, which I think they are, then a bat-wing on a pegasus might be considered as beautiful as a bird’s wing. In the same vein, some of the more outlandish, strange, and original gargoyles and grotesques may be off-putting more because we are not prepared for them than because they are inherently ugly. Indeed, the lines and shapes, and oddness of them can be quite beautiful, in its own right, and yet repel us because, unlike griffins or dragons, we are not used to seeing nature distorted in that particular way. The first time I saw a chinese dragon, I thought it pretty ugly, all bug-eyed and wide-mouthed, but as I became accustom to the art-form, I learned to appreciate their beauty. A lot of art and architecture is like that, and music, too. Some songs or pieces of music I love at the first hearing. Others grow on me over time, and I’ve even had a few that I hated, at first, that I now love. I never liked modern art much, but the more time I spent studying it, the more I came to appreciate Franz Marc, and Mark Rothko, and others as well. Of course, not everyone can learn to like every thing. I’ve never liked Rococo art or architecture, it grates on my nerves, and probably always will. Some people like it, though, and that thought makes me take a step back and consider the validity of their position. Somehow, it resonates with them in a way that it doesn’t with me. And as I see nothing morally evil in such differences in aesthetics, I’m inclined to consider them facets of the variety inherent in God’s creation. Sorry for the ramble! I hope you find it interesting, if not thought-provoking. Spiritual beauty is much more clear-cut than its physical counterpart. The Gothic cathedrals (with their gargoyles) were a product of the medieval mind. I would not recommend gargoyles for a piece of modern church architecture, but I do think they belong very much on Gothic structures. I find depictions of angels in religious and funerary architecture to be both more disturbing and more theologically problematic than gargoyles. This is especially true of cherubic child angels fluttering around Christian graves, homes and churches. Gargoyles seem more likely by comparison. In a number of ways, we are more superstitious than our medieval ancestors. I don’t consider cherubs to be angels. (Guess that’s another of my idiosyncrasies.) I interpret them more along the lines of the pagan eros concepts. As to your final comment… now that’s a provocative statement! Cherubs certainly are more akin to eros. Notice that whenever an angel makes an appearance in the Bible, the first words out of his mouth are always, “Fear not.” One would hardly feel fear at the sight of a cherub. In fact, one would be tempted to tickle it! Tickle it perhaps. I think I would pity it, and be tempted to mock it. They are, after all, a terribly trite imitation of the real thing.